Tiger Woods should have another gift basket waiting on his doorstep today, this time from Sean McManus to go with the ones from Mark Lazarus, Mike McCarley and Fred Ridley. Okay, maybe The Masters doesn't do gift baskets. Anyway, Tiger helped deliver a 6.1 overnight final round rating for the 2018 PGA Championship. The audience peaked at 8.3 late in the round. Sunday’s final round of the PGA Championship earned a 6.1 overnight rating on CBS, up 69% from last year (3.6), up 56% from 2016 (3.9) and the highest since 2009 (7.5). The previous mark was a 6.0 for the 2014 final round. The 6.1 is tied as the highest golf overnight outside of the Masters since the final round of the 2012 U.S. Open (6.6). Some might point out that the 6.1 much better than 2014's 6.0 at Valhalla featuring the unforgettable Rory-Rickie-Phil finish. However, sports ratings have been on a decline and sizable numbers have moved to streaming, making the rating that much more impressive for CBS. Mark Cannizzaro of the New York Post landed an exclusive interview with Patrick Reed, who discussed just how likable his pro-am partners find him. Bobby Joe Grooves is alive and well! The former Champion Golfer of the World may need a food tester at Carnoustie this year, though his comments were clearly made with an understandable bias toward wanting to win the Masters and become a career Grand Slam winner. From James Corrigan's Telegraph story, with comments made before this week's Wells Fargo Championship. The story goes on to say that McIlroy's wife had to push him out of the house after suffering an understandable bout of post-final round misery following the 2018 event where he trailed by three heading into the final round. "Post-Masters coverage of Patrick Reed demonstrates the value of being likable"
Good take here from Jay Rigdon at Awful Announcing on the jabs and other criticism of Patrick Reed for wearing the green jacket wherever he goes. But people love Phil Mickelson! And he’s earned it, too, for the most part. So things like that slide off of him, while people go out of their way to paint Reed as a clown for wearing the green jacket to a basketball game. The lesson, as always, is that the media (social and traditional) tends to cover people they like more favorably, fair or not. There are plenty of legitimate reasons to be annoyed by Patrick Reed. Wearing the green jacket everywhere shouldn’t be one of them. Kyle Porter also touched on this and Reed's inconsistency as reasons he's not getting the same respect as recent major winners. "Matt Parziale's week in Xanadu"
John Strege files a nice follow-up read with U.S. Mid-Amateur champ Matt Parziale after his Masters missed cut. The firefighter chimes in everything from the practice rounds and amateur dinner to his fiance's newfound interest in golf. It's interesting to see Patrick Reed suggesting his Masters win validates a strategy to go equipment-deal free. I wonder if other players will forsake the money and full support of a tour team? Wait, this just in, sources close to 300 of the world's best golfers just whispered in my ear and said no &^$#%* way. Bill Speros with a roundup of Reed's New York visit following his Masters win. Both Alan Shipnuck of Golf.com and Ian O'Connor of ESPN.com talked to Patrick Reed's parents Sunday after their son won the 2018 Masters. Bill and Jeannette have not been in touch with their son for six years, with Shipnuck reporting they were escorted off of Pinehurst during the U.S. Open at the request of Justine Reed, Patrick's wife. O'Connor wrote that he joined Bill Reed in tears. So we cried together Monday morning, two 50-something fathers talking about regrets and family divisions and the things people wished they would have said and done before loved ones passed away. We talked about green jackets, too. Patrick won the Masters 3 miles from where his father Bill and mother Jeannette and younger sister Hannah watched with family friends Sunday evening from their Augusta home. They were uninvited guests to the coronation of golf's brash new 27-year-old king. Saturday's third round of the 2018 Masters saw a nice increase while Sunday's finale with Patrick Reed and Rory McIlroy in the final group was up 16%. 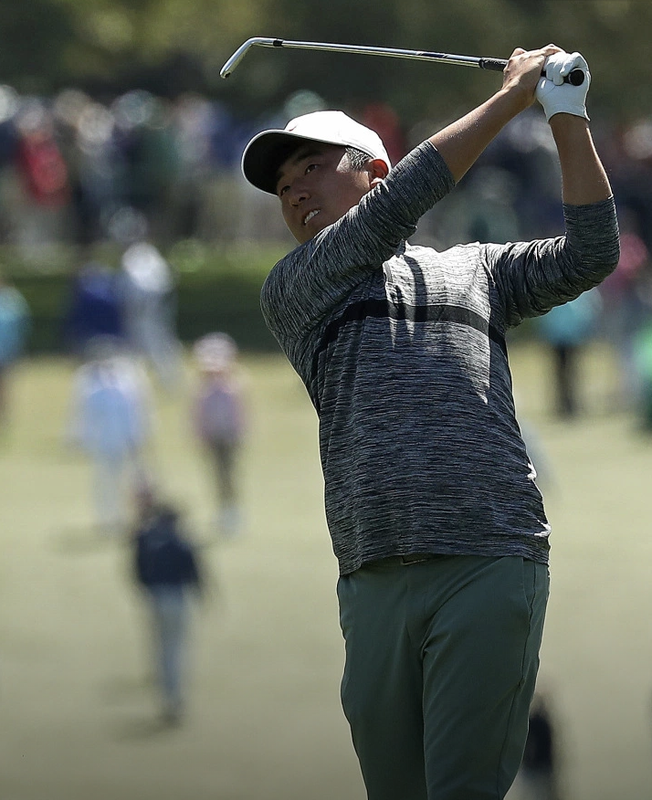 We see ratings increase numbers like that all the time, but when it's The Masters that means we're talking about a lot more eyeballs, two million to be exact: 13.027 million average television viewers versus 11.051 million last year. Also note the streaming numbers at the very end. CBS Sports’ third-round coverage of the 2018 Masters on Saturday, April 7, earned an average household metered market rating/share of 5.7/13, up 24% from last year’s 4.6/11. This year’s third-round rating peaked with a 6.1/14 rating/share from 5:45-6:00 PM, ET and a 6.1/13 from 6:15-6:30 PM, ET. CBS Sports’ final-round coverage of the 2018 Masters on Sunday, April 8 was seen by an average of 13.027 million television viewers on CBS, an increase of 18% from last year’s final round (11.051 million), according to Nielsen live plus same day fast national ratings. Yesterday’s coverage earned an average national household rating/share of 7.9/18, an increase of 16% from last year’s 6.8/16. This year’s final round was the highest-rated and most-watched golf telecast since the final round of the Masters in 2015 (8.8/20; 14.231 million viewers). The final round peaked with a 9.9/21 rating/share and 16.836 million viewers from 6:15-6:30 PM, ET. CBS Sports’ live streaming video coverage of the 2018 Masters Tournament, featuring four channels of golf action available on CBS Sports and Masters digital platforms, drew record viewership with 873 million total minutes of coverage streamed, an increase of 110% from 2017. There was plenty to kick around from a Masters that lived up to the hype, even if the winner might not have been the mega-star or legend some hoped. We cover a bit of everything in the latest ShackHouse, presented by Callaway and on The Ringer podcast network. As always, an iTunes subscription or other locale is best for subscribing and listening. We've got a ShackHouse in the can that should push overnight and I'll be on Morning Drive to discuss a sensational Masters which, I believe, lived up to the hype. Patrick Reed won't be the most popular champion on a day Rickie Fowler came excruciatingly close to winning his first major, Jordan Spieth played possibly the best round of his career until a branch intervened, and Rory McIlroy missed an opportunity to be a career Grand Slam winner. Eamon Lynch considers what makes Reed a worthy, if complicated winner. Ryan Lavner is well versed in the Reed backstory and does a lovely job summing up the day and the mixed-feelings about the win. I penned a few conclusions and assessments of the week for Fowler, McIlroy, Spieth and Rahm. George Willis of the New York Post on the sordid family history that makes Patrick Reed a Masters oddity. Bill Fields on this being a Sunday to remember. President Donald Trump Tweeted his congratulations. Webb Simpson had a special final round not long after losing his father, who brought him to The Masters, notes The Forecaddie. Paul Casey had an amazing run at Amen Corner Sunday. Doug Ghim holed out for birdie at the 18th hole, capping off a special week, as he writes in his Golfweek-exclusive diary. Jim McCabe on the unusual role No. 12 played Sunday as an enabler of birdies. Classic Sports TV’s roundup of shots shown, you might be surprised who got more airtime than others. A final-round 64 from @jordanspieth electrified patrons today at #themasters. Will Ricky and Carley Bobby become part of Masters lore Sunday, or will the Jean Girard in this drama become the sixth player to complete the modern Grand Slam. Or did they peak, opening up a chance for someone to come from far back? It's a tradition unlike any other and the hole locations for Sunday's 2018 Masters final round appear...traditional. Here are five things we learned from Saturday, including insights on a tee shot distance disparity between the leaders, Rory as a mudder and Reed's streakiness. It's 2-2 at Golfweek in picking a winner. As Rex Hoggard writes for GolfChannel.com, this one is likely about Patrick Reed and Rory McIlroy and fistrionics. But who has more pressure, Joel Beall considers that for GolfDigest.com in a match play format. Beth Ann Nichols has the Reed angle covered after his Saturday 66. Eamon Lynch points out the redemption factor for Rory McIlroy and the other intangibles his potentially historic day. Alan Shipnuck reminds us that Mclroy currently fits into that class of players who should absolutely have won the Masters and have not. And remember what the Forecaddie reported, Ricky Bobby will be deprived of his power color. Jon Rahm moved into contention with a 65 and credits how he paced himself coming in along with a driver head change, writes GolfChannel.com's Ryan Lavner. It wasn't all bad for Tiger, whose 72 and made cut likely has him landing back in the world top 100, writes Bob Harig. Make sure to read Doug Ghim's diary from his Saturday round with Bernhard Langer. Ghim will be low amateur and in Butler Cabin this evening. Happy 60th birthday to Amen Corner, writes Bill Fields for Masters.com. Your Sunday tee times and TV Times. Remember Amen Corner Live should start around noon when Vijay Singh and Jeff Knox arrive. Yesterday, btw, member Knox was the only player to birdie the 11th hole. Chris Schenkel fans will love this introduction to Masters Sunday featuring vintage sound from the longtime broadcaster juxtaposed over today's scenes. If you missed it earlier this week Gene Wojciechowski filed this piece for ESPN's coverage on the Green Jacket, the most famous sports jacket on the planet which will be presented in the ceremony for the 70th time this year. For our story on the 13th hole, Ben Crenshaw spoke of the 13th tee and the completely unusual quiet the leaders face as they pursue the green jacket. And this from the official Masters social coverage, narrated by Jimmy Roberts. Welcome to Sunday at #themasters. Work with me here...open your minds, breathe in and consider the possibilities. It is, after all, a tradition unlike another other for slightly zany things to occur on Masters Sunday. My Golfweek five crazy Sunday scenarios. An average of 3.9 million people watched ESPN’s telecast of the second round of the Masters Tournament on Friday, the most-viewed Friday at the Masters since 2013 and an increase of 50 percent over last year’s audience of 2.6 million, according to Nielsen Fast National data. The second round, which aired from 3 p.m. until 7:45 p.m. ET, ranks as the third most-viewed Friday since ESPN began airing the Masters in 2008. In addition to being up 50 percent over 2017’s Friday audience, the telecast also was up 28 percent over the audience of 3.1 million for the second round in 2016. The phantom winds blew at Augusta National and baffled the players. I noted a few moments in this Golfweek roundup of things we learned from the day, and Ron Green Jr. covered it as well for Masters.com with more player comments. The wind, fast greens, tough hole locations and reachability of the par-5s led to rounds over five hours for the first few groups and 5:40 for the late groups. Patrick Reed took the lead with a spectacular 66 that included three stretches of three birdies in a row, but it was his more conservative approach to the first hole, as suggested by his wife, that was of equal interest, reports Brentley Romine. Reed's college coach and swing coach Josh Gregory is not surprised by his performance, but he's also superstitious and leaving town as he had planned, writes Doug Stutsman. Ian Poulter was put on the clock twice, and as Kevin Casey reports for Golfweek, he was not phased. Dan Kilbridge went the entire way with Tiger and reports on the day. Michael Bamberger concludes that we should have listened to Tiger when he said a win this week would be a tall task. Fred Couples made the cut again despite looking like he could WD at any minute, writes Dylan Dethier for Golf.com. Mark O'Meara makes it official, the 1998 champion has played his last Masters, writes David Westin. 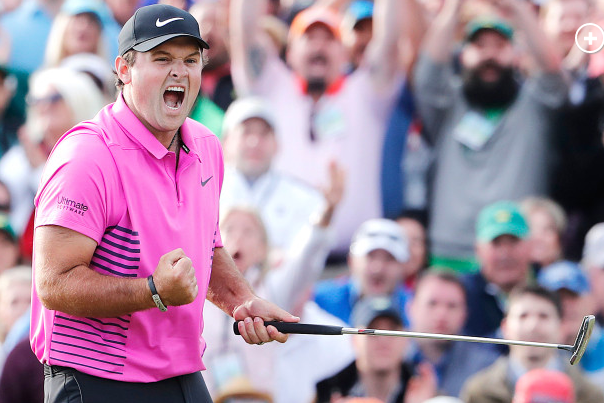 The updated odds for the weekend have 36-hole leader Patrick Reed at 5/2. Martin Kaufmann feels we're not getting enough shot tracing. From what I've seen, it does not do a good job helping us see the ball as it falls from the sky. Brian Wacker on the scene at Augusta's airport. Pretty impressive bump given that Tiger Woods was not in the afternoon wave for the ESPN window. Nearly three million viewers tuned in for ESPN’s telecast of the first round of the Masters Tournament on Thursday, an increase of 40 percent over the Thursday audience of last year, according to Nielsen Fast National data. The telecast, which aired from 3 p.m. – 7:20 p.m. ET, averaged 2,971,287 viewers, up 40 percent from the 2,129,214 Thursday average in 2017 and up 24 percent from the 2016 Thursday average of 2,397,624. The telecast ranked as the fourth-best Thursday since ESPN began airing the Masters Tournament in 2008, exceeded only by the years in which Tiger Woods was featured in Thursday coverage (2009, 2010 and 2015). Most of Woods’ round on Thursday had already been completed when ESPN’s telecast began. The telecast also saw growth across all key demographics, with a 44 percent increase in persons 25-54. Doug Ferguson's AP game story focuses on Jordan Spieth appearing comfortable in familiar surroundings. Steve DiMeglio's USA Today gamer reminds us after day one, that this one still has the potential to live up to the hype. Brentley Romine of Golfweek puts Spieth's intriguing admission that he'll always have demons here, but as Romine notes, as did Joel Beall at GolfDigest.com it was also telling how confident Spieth appeared after his round. His putting is back. That and a few other telling stats suggesting our champion will likely come from the top 10, I write in an item that also looks at a tighter cut at the 15th. Tony Finau’s recovery from an ankle sprain fit neatly into his improbable life story, writes Ryan Lavner at GolfChannel.com. Kevin Casey on Patrick Reed and Henrik Stenson bucking their Augusta National pasts with opening 69s. Tiger Woods made a mess of the par-5s in an opening 73, writes Alan Shipnuck, who assesses the day as jittery. A bus driver has been charged with DUI after flipping a vehicle transporting Masters patrons from Atlanta. There were several serious injuries, reports the Augusta Chronicle's Susan McCord. David Westin on covering his 40th Masters and the art of filing player diaries. Dave Kindred talks to merchandise buyers on their way out and in Kindred fashion gets many to confess to their buying decisions. And dollars...invested in helping to improve the Masters. In nine of his 17 rounds here, Spieth has finished with the lead. Round two featured groups coverage does not include Jordan Spieth (10:53 am ET), so you'll have to pick him up On The Range and then eventually on Amen Corner Live coverage starting around 10:30 am. ET. A beautiful shot by J.D. Cuban of Jordan Spieth's reflection. House spent Thursday at the 16th hole with Bill Simmons and dad, and we recount their experience along with an intriguing first day at the 2018 Masters. Bill, Bill's dad and House discussed their experience in on the Bill Simmons Podcast. And while we're talking Bill, make sure to bookmark his Callaway Live appearance with Harry Arnett. On a lively Masters opening day, the accomplishment of U.S. Amateur Runner-Up Doug Ghim should not go unnoticed: he eagled the par-5 13th and holed out at 18 to earn himself some crystal goblets. Ghim is writing a daily diary for Golfweek.com and he shares some great stuff from the day, including his nerves, a chat with UT alum Jordan Spieth and the thrill of making two eagles. Every other tournament there is kind of a generic introduction before you tee off. At the Masters, though, it’s “Fore please. Doug Ghim now driving.” When I heard that my body went numb. To hear my name associated with that phrase, it’s something I’ll never forget. Somehow I got the ball on the tee. Somehow I didn’t soak my glove before the first tee shot. And I made the best swing that I possibly could and the ball found the fairway. I can now say that I striped my first tee ball at the Masters.